Friday, March 25th dawned in Manama as F 16 fighter jets, rocket launchers exposed, soared low over Pearl Square, across Manama and out over villages and towns throughout the island kingdom of Bahrain. The spectacle of super-sonic war planes, bearing rocket cannons, soaring over unarmed civilians protesting for democratic rights against an autocratic regime pointed to the real relation of forces on display. U.S. imperial reach in the entire region is present in the form of the Fifth Fleet with its attack aircraft carriers, missile arsenal and supersonic attack jets at the ready. The Royal College of Surgeons Ireland sent a fact-finding team to Bahrain at the weekend amid claims of attacks by state forces on hospitals and medical staff, including members of the RCSI. At least four Bahraini senior consultants are known to have been detained by the state. The circumstances of custody are unknown, but relatives of the medics have said they fear for their lives. Senior consultant Ali al-Ekri was arrested on March 17th while performing a surgical procedure at Salmaniya Hospital in Manama, where hundreds of injured had been admitted following attacks on pro-democracy protesters. 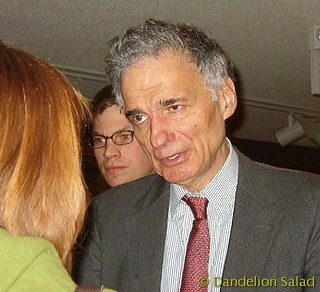 Ralph Nader live at Stony Brook University on March 22nd 2011. Sponsored by the Undergraduate Student Government at Stony Brook University. Sad news. Sympathies and condolences to Joe’s family and friends.